Burgers are a dish that you can find in restaurants ranging from the smallest greasy spoon to the most elegant fine-dining spot. Burgers are also a favorite of many home cooks, especially during grilling season. 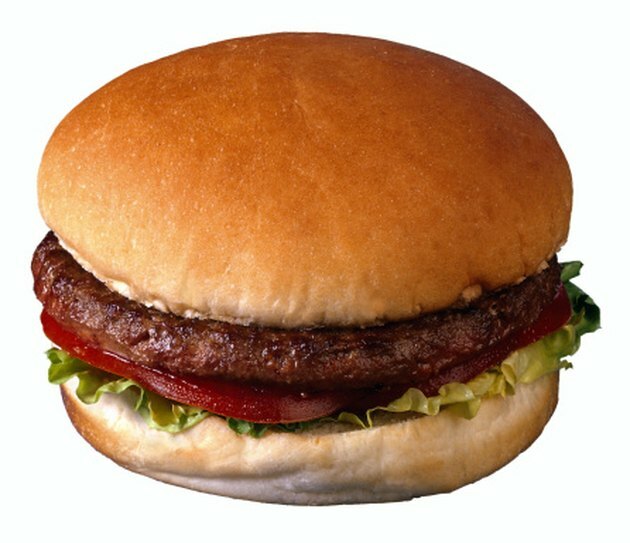 Sometimes hamburger meat has a tendency to break apart or crumble as it cooks, essentially ruining your well-formed patties. Adding a binder such as egg to the meat will help your patties hold their shape before and after cooking. Add a pinch of salt and pepper and any extras you want in there like minced onion, parsley, Worcestershire sauce or Dijon mustard. Crack one egg into the bowl and mix all of the ingredients together with your hands. Continue to knead the meat until all of the ingredients appear to be incorporated evenly. Remove palm-sized balls of the meat mixture from the bowl and form them into ½-inch-thick patties with your hands. Stack the patties on a plate, with a piece of waxed paper between each one. Continue making the patties until all your meat mixture is gone. Place your burger patties onto a medium-high grill or skillet. Cook for five to 10 minutes, flipping once until they are cooked just cooked through. You can beat the egg in a bowl before adding it to the meat if you prefer. Add up to ¼ cup of breadcrumbs to the mixture if the meat seems too wet after adding the egg. Use other ground meats like pork or turkey for a different flavor. Wash your hands thoroughly before and after handling the raw meat.